2. 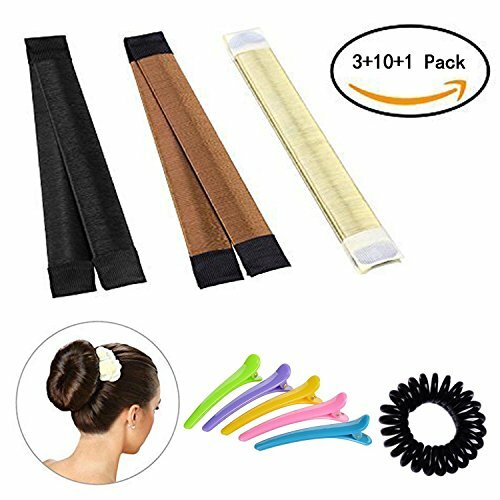 Straight the hair bun tool, and put your hair in between the two bands. 3. Hold the both ends together, and roll upwards to the base of ponytail. 4. Bend and snap together the two bands. 5. Make little adjustment to make sure the bun maker is full covered by your hair. PERFECT FOR ANY OCCASIONS - Daily Life, School, Night out Party, Wedding, Graduation, Prom, Ballet Recital, Yoga Practice and Many More. complete satisfaction & risk free.If our product doesn't meet your needs, just send it back for a full refund or replacement! If you have any questions about this product by haomiao, contact us by completing and submitting the form below. If you are looking for a specif part number, please include it with your message.